There’s two ways to take over a country. You can invade it. Or do what Australia does. Sell it off piece by piece. It all started fifty years ago. They built a railway line 300km long through some of the harshest land in the country. 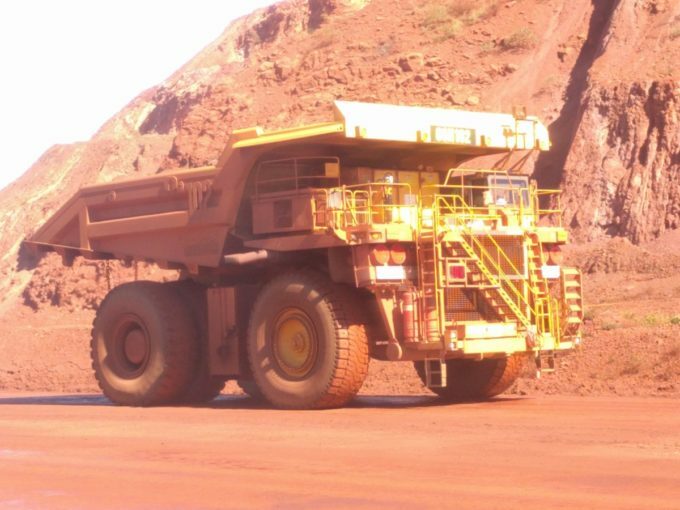 It connects the iron ore mine in Tom Price to the port at Dampier near Karratha. It’s an impressive and massive operation. In the middle of no where, huge two hundred ton trucks cart the ore gouged from these gigantic pits to the crushing plant. A constant stream of trains, each over 2km long, transport ore to the port 24 hours a day. 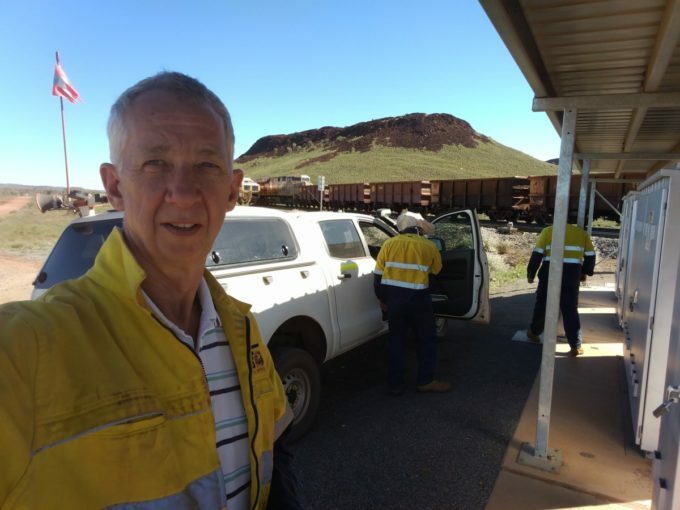 I followed that 300km rail line from Tom Price along the dirt road to Karratha. The road is used to maintain the rail. Nathan and his gang were working on a maintenance job just out of Tom Price. 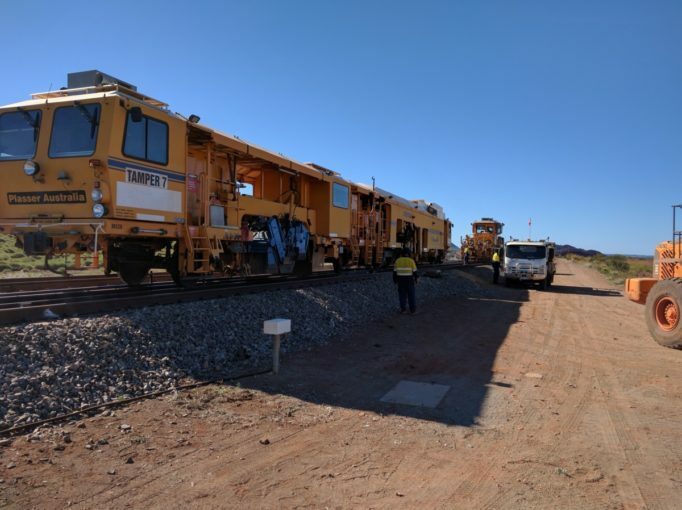 Travis was working at the other end of the rail line just out of Karratha. I felt a bit like a Tea Lady. But I did what any good parent would do when calling into see their kids. I baked a cake. A Beer Cake. It’s an old family favourite. The size of a slab, this German streusel recipe dates back to well before my grandparents time. It was always a favourite to feed the shearing shed workers. That’s what I needed for this trip. By contrast to hundred years ago, these days there’s a zero alcohol work policy. So I went for a Hahn mid strength beer in my recipe. I figured it should keep them at least close to legal. They’re not that hard done by. A ute turns up. They start the genny. I gathered its only purpose was to boil the kettle. It was a short stop as they had a deadline to finish their maintenance job before the next train came through. I also had a another 200k’s to my next cake stop. The boys love it out here. The biggest thing is the comradaree. They’re a good bunch of guys. I’ve met a number of them over the years. But it’s quite clear that to work up here you have to have a name that ends in a vowel sound. There’s Jusso, Cossie, Higgo, Little Higgo, Popey, Deano, Travvy, Marsee, Nayda, Coffa… the list goes on. If your name doesn’t qualify, they doctor your name to suit. Dotted along the long stretch of train track are huge computer controlled locomotive size machines. They go along the track, lift up the rail and sleepers and then shake the bejusus out of it before settling it firmly back into the ballast. One of these Tamper machine locations was my next stop. After endless rattling and shaking along this dirt road I was close to find the turn off for my next cake delivery stop. These machine are impressive. Inside it looks more like a plane cockpit with an array of buttons, lights and computer screens. But more importantly it includes a kettle. A special cake and coffee stop with a difference with these guys. 4am the alarm went off. 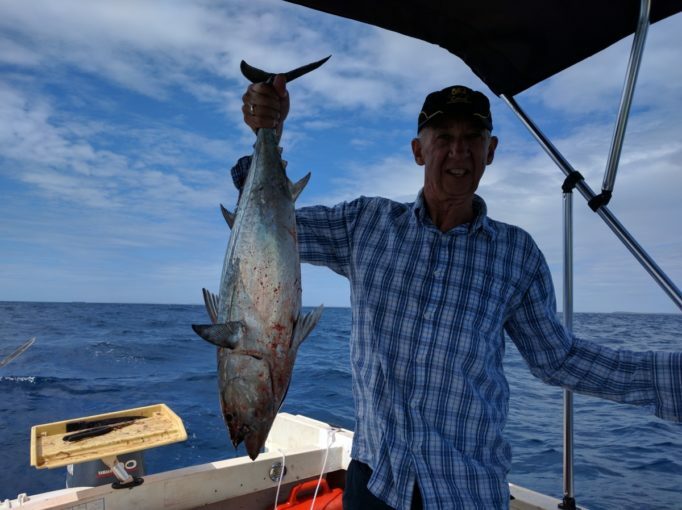 We were off chasing mackerel out from Dampier. But the show stopper was the spectacular whale show. From within metres of our boat to horizon displays of these monsters flying out of the water. A marine nature’s paradise. 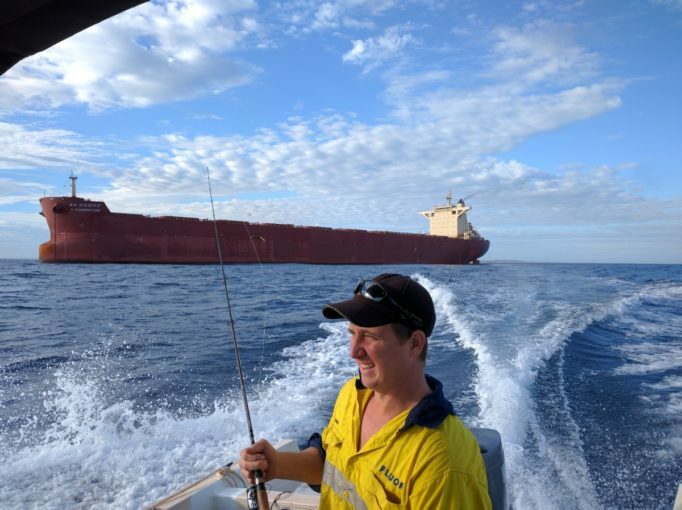 But meanwhile huge ships line up off the coast waiting their turn to take the next piece of Australia back to their country. 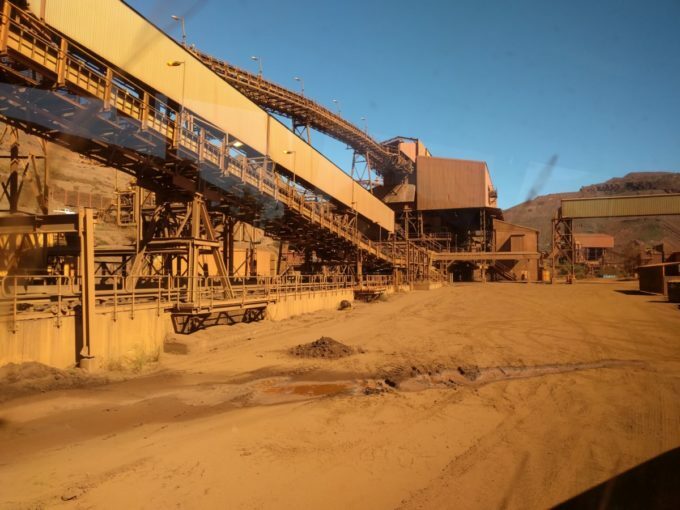 It may be iron ore now. But where will it end. 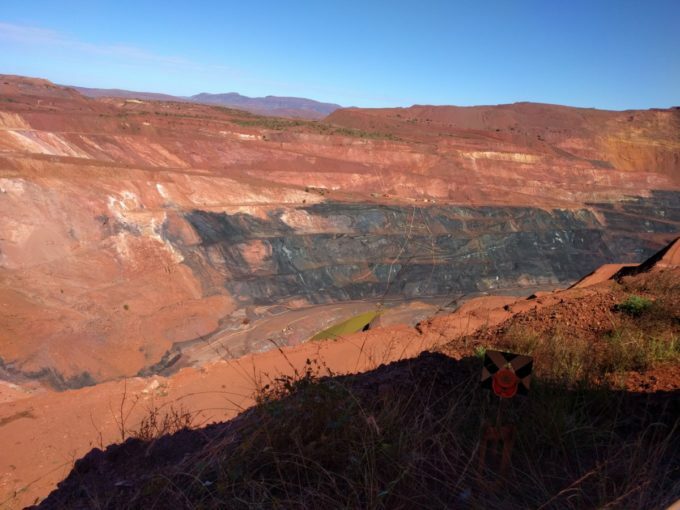 This is only one mining operation. What about all the other major miners doing the same massive operations. Give it a few years of this continuous 24 hour a day constant gnawing away at our land as they work their way down the whole country and what will be left? As the sea levels rise from global warming, I reckon we’ll have no choice but to eventually packup and move down to Tasmania. Maybe by that time we’ll all be ready to downsize anyway.